Halsey initially checked in on the Forum interested in an inboard for Elizabeth. We have been in touch and he sent in the following pictures. 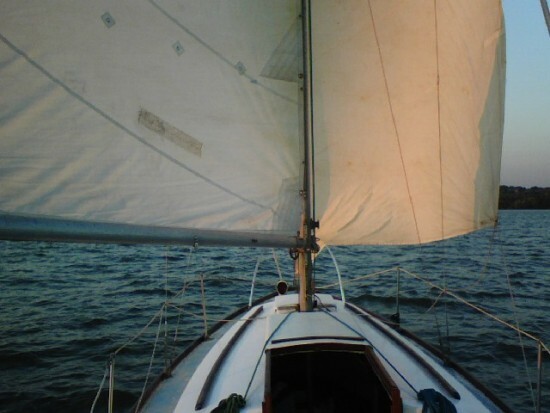 Here is a picture of my boat running down wind on the Hudson at sunset. if you look carefully the weather deck needs a lick of paint; I just couldn’t wait to go sailing! Webmaster Note 1: Notice the clam type hand rails - Elizabeth is one of those very early Dolphins and she is still out there showing her stuff. Tell her not to worry - she's the prettiest gal around and with a little TLC, a new dress and some make up she'll be irresistible. She must have a very interesting story and we need to to get her to tell it. Right now, as one of those ladies of a certain age, she's either quite shy at being found (or maybe teasing us?) by not letting us see more of her! Webmaster Note 2: As soon as Elizabeth saw that we wanted to see more of her she obliged - here she is at her mooring - no doubt the prettiest gal around, even with her OB showing! Thanks for the reply. 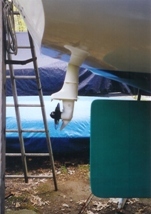 I have a 4hp outboard too, but its a short shaft, the prop barely gets wet. So before I go changing the motor mount for an engine I am not married to I would like to see what’s available. 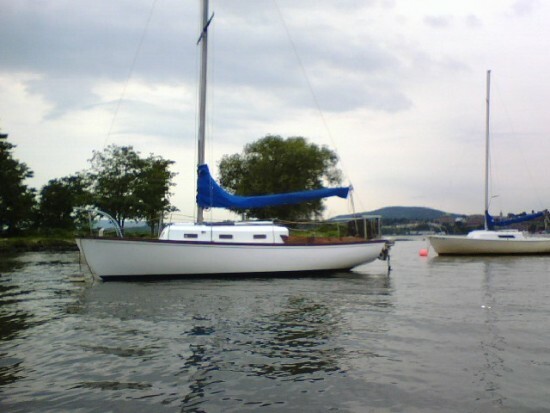 I plan to take her cruising this summer, and would prefer an inboard for rougher water. Besides outboards have their place, just not on my classic boat. Her name is Elizabeth. Its the name she had when I got her. Its a good sea worthy name, and tried to avoid some bad luck, so I kept it. She's a '61 O'Day, at least that's what the expired registration read. No hull number or other indication of her original identity. The interior is exactly as the old O'Day brochure shows (although I do have tentative plans for a refit soon.) I sailed her last fall on the north river (aka Hudson) where she is currently hauled out. I'm not entirely sure where I want too moor her this coming season. time and convenience will tell. I could have bought a long shaft motor, and sometimes I wish I had, but since I planned to use the motor as a dinghy motor as well, another compromise had to be made. I can reverse if I have to by twisting the motor but I, and my back, have never regretted not purchasing a motor with a reverse gear – an extra 33 lbs! I have many times wished I had an inboard, and many times have been glad I don’t have one. On the other hand it does seem like a boat is not 'grown up' if it has a outboard, no matter where it is. Halsey and your webmaster exchanged several emails on the subject of the 'infamous sheer clamp" which may be interesting to those early Dolphin owners that have or suspect similar problems. These emails are in our Technical Section and includes an article and picture on Elizabeth's main bulkhead replacement, To go there click here. June 22, 2011. 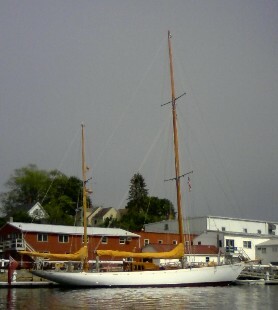 While in Camden, Maine last week aboard Marionette (2011 Summer Cruise) your webmaster was hailed by the captain of another somewhat larger yacht passing by in the harbor who recognized Marionette as a Dolphin 24. I barely heard him say there was a 'Halsey" was aboard but he was down below - and that Halsey also had a Dolphin 24! BTW, the other boat was Belle Aventure, a Fife custom 94' LOA, that only a picture could describe. We did not connect then as our boats were in a tight channel on route to berths in different parts of the small harbor. But, we met later, and well, talked about Dolphins.... Halsey's news is that he got Elizabeth a trailer and drove her to her new homeport in Lincolnville, just up the coast a few miles from Camden. Since we last were in touch Elizabeth has also made the 1000+? mile round trip 'on her own bottom' from her old homeport on the north Hudson River, down through New York City and Hell's Gate, out Long Island Sound and down east to Lincolnville, Maine - and back after a 1 day stopover! June 23, 2012. New Dolphin owner Graham Coates, Yankee #207, checked a few days ago and advised he was thinking of sailing his boat from Rochester, New York via the Erie Canal, down the Hudson River, through New York City and up Long Island Sound to a yet to be determines port somewhere on the eastern Connecticut coast. This news immediately brought to mind Halsey's 2009 voyage in Elizabeth from the Hudson River to Rockland, Maine and back. We asked Halsey for a summary of Elizabeth's log for this cruise. We have put it in our Stories Section. Click here to go to it.